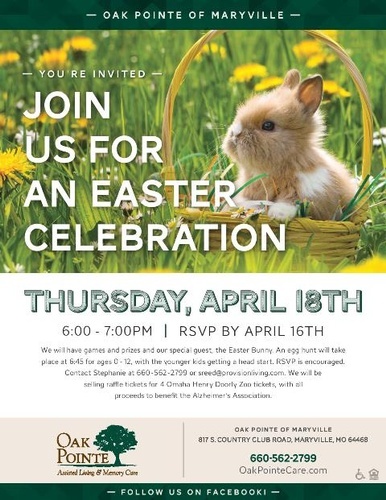 Join us for a fun Easter Party for the kids! We'll have games, prizes and our special guest, the Easter Bunny! An egg hunt will take place at 6:45 for ages 0-12, with the younger kids getting a head start. Be sure to bring your camera for a photo opportunity with the Easter Bunny! We will also be selling raffle tickets for 4 Omaha Henry Doorly Zoo tickets, with ALL proceeds going to benefit the Alzheimer's Association. Prices are $5 for one ticket or $10 for two. RSVP is encouraged. Thursday, April 18 from 6-7 p.m.